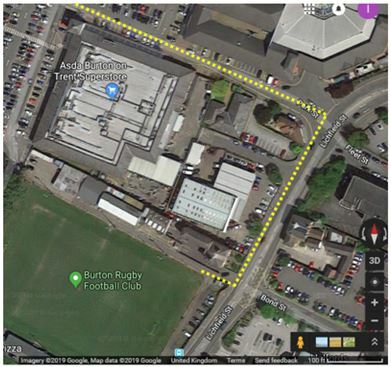 Burton RFC have sent us some information about car parking for the Burton v Derby game on Friday 15th February 2019. KO 7.45pm. There is limited parking space at Peel Croft and this will be available on a ‘first come – first served’ basis. Therefore, a need for parking outside of the ground will be inevitable and the purpose of this information is to provide guidance and highlight that there is a risk of receiving parking tickets. On the plan below local Car Parks are identified, as well as local streets where there is some parking. C – SAT NAV POSTCODE: DE14 3ST – Entry point at X. Parking usually free after 6pm (check required on the day). Pedestrian route to club shown as dotted line below. This information is provided in good faith and Burton Rugby Football Club Limited accepts no responsibility regarding use or interpretation.